These stylish Playing Card Cuff Links are available in two styles. Choose from Ace/Ace Cuff Links and Ace King Cuff Links. Each pair of cuff links features a white enamel finish with metallic gold edges and outlines. 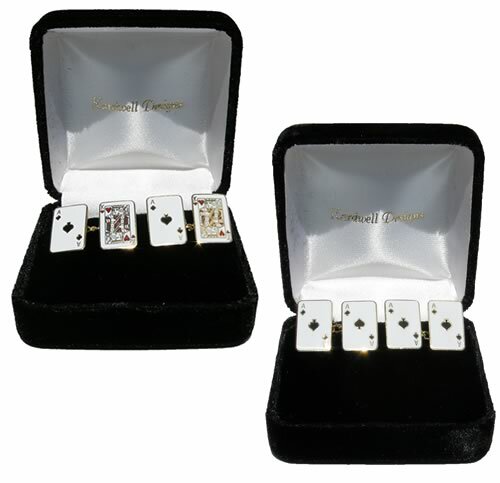 The Playing Card Cuff Links come nicely packaged in black, crushed velvet storage/display boxes. On Sale: $12.86. Was $19.95. Save 36%! For additional information on our Playing Card Cuff Links or any of our other items, please contact us toll-free at 1-800-233-0828. You might also be interested in browsing our selection of Casino Theme Gifts.